Demand for cobalt in batteries is expected to grow at a rate of 14.5 percent per year to 2027, by which point demand from this end-use sector alone could exceed 240,000 tonnes — double the size of the total market in 2017. As interest for cobalt continues to increase and the electric car revolution gathers pace, investors are wondering what’s next for the critical metal. The increase in cobalt prices seen since last year pushed carmakers and technology companies to search for ways to decrease its content in lithium-ion batteries, with nickel taking center stage. 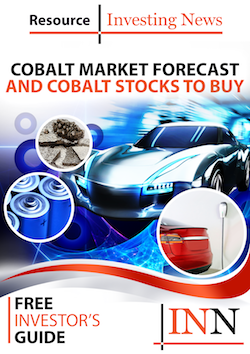 But despite announcements from companies like Tesla (NASDAQ:TSLA), which plans to reduce cobalt to “almost nothing” in its batteries, analysts continue to predict that growth in cobalt demand will increase significantly in the coming years. According to Roskill, demand for cobalt surged at a rate of 8 percent per year between 2010 and 2017 to reach 118,000 tonnes, with demand from the battery sector contributing the most to that increase. In fact, the research firm estimates that demand from this sector increased at a rate of 13.5 percent per year between 2010 and 2017, meaning that batteries now account for more than half of total cobalt consumption. “Demand for lithium-ion batteries is set to grow enormously over the coming decade, driven mostly by the electrification of the automotive sector. This will require huge volumes of additional cobalt oxides and sulphate,” Roskill says in its latest report. Demand for cobalt in batteries is expected to grow at 14.5 percent per year to 2027, by which point demand from this end-use sector alone could exceed 240,000 tonnes — double the size of the total market in 2017. Roskill says with demand for cobalt also set to increase across other key end uses, such as nickel alloys used in aerospace, the total market could surpass 310,000 tonnes by 2027. Analysts expect the aggressive expansion plans of major producers like Huayou Cobalt (SHA:603799) to be enough to supply the market for the next five years, but after that more capacity will need to be built. “This will require more investment, which given the outlook for cobalt demand and cobalt prices, should be forthcoming,” the Roskill analysts said. “However, while there should be suitable amounts of cobalt chemical capacity for the next few years, a lack of recent investment in metal capacity, coupled with shutdowns, is set to lead to a widening metal deficit, which should serve to keep prices high,” they added. According to Roskill’s base-case outlook, new refined capacity will need huge additional amounts of feedstock, but the market should be supplied sufficiently to 2023 thanks to expansions from existing producers, such as Katanga Mining (TSX:KAT), and major advanced projects, such as ERG’s RTR in the Democratic Republic of Congo. The report also points to constraints in supply that the market could face after that, with a combination of further expansions from existing miners, new projects and perhaps the restart of some operations on care and maintenance to be required if supply is to meet demand. “With the vast majority of cobalt mined as a by-product of copper and nickel mining, future mine supply is complicated by the fact that cobalt output is principally governed by demand for, and subsequent supply of, copper and nickel,” the report says.